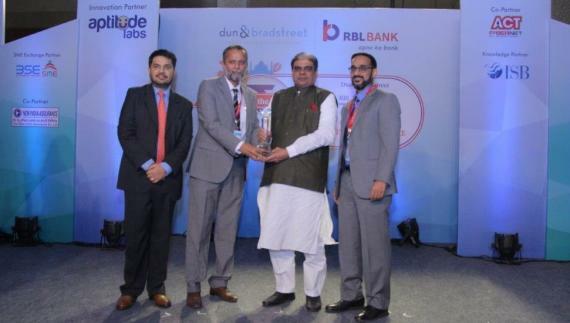 PCN members in India, Express Global Logistics (EXG) have been honoured at the Dun & Bradstreet and RBL Bank Ltd SME Business Excellence Awards 2016 in the Transport & Logistics Sector. Dun & Bradstreet are the world's leading provider of global business information, knowledge and insight and speaking on the occasion, Mr. Kaushal Sampat, India President & Managing Director of Dun & Bradstreet said; "The publication profiles 100 SMEs, which we call 'The Select 100', who have shown a consistent performance over the past two years (2014 - 16) and show high degree of resiliency for better growth prospects. The SME Business Excellence Awards 2016 is a platform for showcasing the success stories of high-performing Indian SMEs. The objective of the awards is to encourage the culture of excellence and transparency among SMEs. The awards were open to all SMEs in manufacturing and services sectors with basic qualification criteria." Congratulations to Express Global Logistics from the PCN Head Office on another esteemed award! Express Global Logistics is a leading international project forwarding and custom brokers company established in 1946. With its 24+ offices, EXG provides 'need-based logistics solutions' to our customers. EXG has handled and are currently handling number of power, fertilizer, auto and infrastructure projects. Many of the projects we handle can range up to 100,000frt per project with cargo valued at up to US $800million. Apart from handling regular project cargo, Express also handles general cargo, inward and outward.